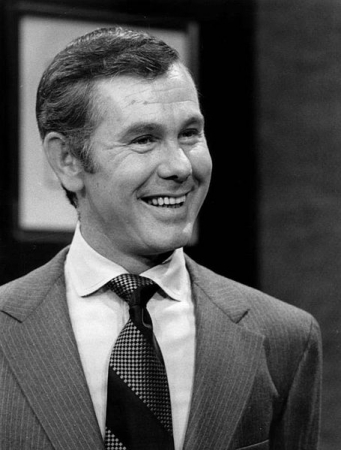 There'll NEVER be another Johnny Carson. I enjoyed reading the anecdote about "...wearing nothing but cutoffs..." I have fond memories of laying out in front of the tv, as a teenager (my parents allowed me to stay up later then) during the late 1970s, and enjoying our man, Mr. Johnny Carson's program. The late night light-hearted moments which springs to mind as I type this was when Mr. Carson removed his shoe and sock from his foot, the camera zooming in and the band striking up background music as he moved his foot as "beautiful model" might move her body on a fashion runway. He presented his foot in this manner after his female guest commented how beautiful his feet looked when she noticed him sunbathing at the beach recently. Bette Midler's guest appearance on his show was another moment. I miss him and those days. I lost all interest in late night TV when Johnny retired. One of my favorite Tonight Show memories is Tony Randall talking about flying in a small plane from Manhattan to Fire Island. The pilot was wearing nothing but cutoffs, there was too much luggage, and Tony recalled seeing "secretaries clacking away on their typewriters" in nearby office buildings as they struggled to gain altitude along the Hudson River. It's one of the funniest stories I've ever heard and he told it so well. Johnny nearly fell out of his chair he was laughing so hard. I can't be sure, but I believe this interview took place during the last couple of years of Johnny's reign. Such a hoot!